Magazine repeating firearms are not a new invention. There are some in existence that were developed as early as the 17th century, with several variations known. Almost all of them are finely built arms. Most are of European manufacture and are of flintlock ignition. And importantly, all them are basically impractical and most are dangerous to shoot, not because of workmanship, but because of design. What opened the way for a practical magazine-fed repeating levergun to be built was fixed ammunition. A self-contained metallic cartridge with the bullet, primer and powder in one unit is what made a useful levergun possible. This advancement is generally acknowledged to have begun with Walter Hunt of New York with the patent and manufacture of his "Volition Repeating Rifle". Hunt's rifle is a direct ancestor of Winchester as we shall show. The gun itself was doomed to failure from the beginning due to it's manufacturing requirements. It had a complicated arrangement of two levers and a series of small delicate parts that made manufacturing the levergun a financial liability. But it had fixed ammunition. The Volition rifle was built around Hunt's "Rocket Ball" ammunition. Developed by Hunt the "Rocket Ball" was basically a hollow-based bullet with the powder charge in the hollow base of the bullet. 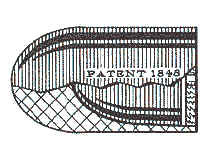 Mr. Hunt secured a patent (# 5,70 1) on August 10, 1848 for... "a ball for firearms, with a cavity to contain the charge of powder for propelling said ball, in which cavity the powder is secured by means of a cap enclosing the back end." It also was a disaster commercially, but it was a beginning! It is generally believed that only one or two of his rifles were ever built. However his ideas were picked up by a Mr. Lewis Jennings and improved upon. From 1849 through 1852 Jennings built and marketed a magazine-fed lever action rifle. The Jennings rifle was manufactured by the Robbins & Lawrence Co. in Windsor, VT. The shop foreman at Robbins & Lawrence was one B. Tyler Henry who figured prominently in lever action design and development. Production of the Jennings ceased in 1852 and it is said that all the investors in the company suffered heavy losses. Money troubles are nothing new to the firearms industry either. In 1854 Horace Smith and Daniel Wesson picked up where Jennings stopped and began manufacturing a leveraction magazine-fed pistol called the Volcanic. It was built in their plant at Norwich, CT where B. Tyler Henry oversaw it's production. In the latter part of 1855 the Smith & Wesson Company was re-incorporated as the "Volcanic Repeating Arms Co." A man named Oliver F. Winchester was one of the principle investors in the new company. The Volcanic Repeating Arms Co. acquired the entire rights, patents and assets from Smith & Wesson and shortly afterwards Mr. Smith left the company. Not too long after he left, Mr. Wesson left also. In Feb. of 1856 the plant was moved to New Haven, CT where the Volcanic firearms continued to be produced, however at a great loss financially. (By this time the Volcanic rifle was in production also) By the following August the company was insolvent. The entire assets of the company were sold to Oliver Winchester who reorganized it as the New Haven Arms Co. Both the Volcanic rifle and pistol were manufactured by the New Haven Arms Co. with B. Tyler Henry as shop superintendent. In addition to supervising production of the Volcanic Mr. Henry conducted experiments on a new type of cartridge. He successfully redesigned the Volcanic rifle to use a large caliber (.44) rimfire metallic cartridge, and the famed Henry lever action repeating rifle was born. Produced from 1860 through 1866, the Henry rifle was revolutionary .. as much for the ammunition as the design of the firearm itself. The .44 Henry Flat was loaded with a 200 grain bullet and approximately 28 grains of black powder. It produced around 1100 fps in the rifle. The ammunition was produced from 1860 until 1934! A pretty long life for a rimfire. Colt even made some handguns in this caliber. Oliver F. Winchester was the CEO of the New Haven Arms Co. and when the name was changed to the Winchester Repeating Arms Co. in 1866 he continued on in that capacity. The rest, as they say, is history. The period of the 1850's through the 1870's was one that birthed tremendous firearms and ammunition developments. There were a huge number of experiments relating to repeating breech-loading firearms. Many were impractical, a lot of them never made it past the drawing or prototype stage, but the patent records from that time period indicate the large number of ideas that were being tried. Experiments were conduction on various types of actions as early as the 1850's. Lever actions, bolt actions, slide actions (pump) and revolving cylinder were all tried with varying degrees of success. The lever action rifle was immediately popular when it was introduced and that popularity has not diminished in the passing years. Quite a few 19th century firearms are still being manufactured in almost identical configuration and mechanisms that they were first introduced with. This is quite a testimony to their design, reliability and practicality. The continuing popularity of Cowboy Action Shooting with it's emphasis on the levergun (as well as other 19th century guns) seems to insure that the lever action's popularity will continue. And with the advent of new ammunition and bullet designs, the leveraction is making it's mark on the Dark Continent and in other corners of the world as a First-Class hunting rifle. Again, this is new to some people today, though I think Teddy Roosevelt and others would argue that point. Over the years the levergun has been used in war and it has been used to keep the peace. It has guarded convicts and mail shipments and kept wives and children safe from harm. It has been used against marauding natives and against sneak thieves in the night. The levergun has been used to feed families and to crop herds. It has been used in hunting large and dangerous game and it has been used to punch holes in paper out to extreme distances. Whatever you use it for, from plinking fun to hunting, from self-defense to shooting matches, the levergun can do it all.